Dr. Mark Guishard, program manager of the Risk Prediction Initiative (RPI) at BIOS, traveled to Ponte Vedra, Florida (U.S.A.) to participate in the 33rd Conference on Hurricanes and Tropical Meteorology this past April. Here are some of the take-home points from the annual science meeting, organized by the American Meteorological Society. Kerry Emanuel, professor of atmospheric science at the Massachusetts Institute of Technology (MIT) and scientific contributor to RPI, summarized the 2017 Atlantic hurricane season. Hurricane Harvey, which made landfall in Texas (U.S.A.) on August 26, 2017 as a Category 4 storm, set a new record for highest total storm rainfall, with 60.58 inches falling throughout its duration. Emanuel found that the probability of a region receiving Harvey’s record-breaking rainfall amount has increased over the last 3 decades. Why? In terms of the rainfall impacts from hurricanes there are two main contributing factors: 1) the amount of water available to the storm to form precipitation, which increases in a warmer atmosphere, and 2) the duration of the storm over a given location. This second factor was found to have been a major contributor to Harvey’s flooding rains and is consistent with another worrying finding. Dr. Jim Kossin, an atmospheric research scientist with the National Oceanic and Atmospheric Administration (NOAA) National Centers for Environmental Information, presented his soon-to-be-published research into the forward speed of hurricanes. His work shows that, globally, over the last seven decades (not including 2017), the forward speed of hurricanes has decreased 10% and that, near land, these effects were even more pronounced. Scientists estimate that with each degree Celsius that global surface temperatures increase, the average rainfall from hurricanes could potentially double due to this slowdown in hurricanes’ forward motion. In other words, hurricanes now have a longer duration over land on average when compared to storms on historical record, leading to longer-lasting impacts like flooding rains. 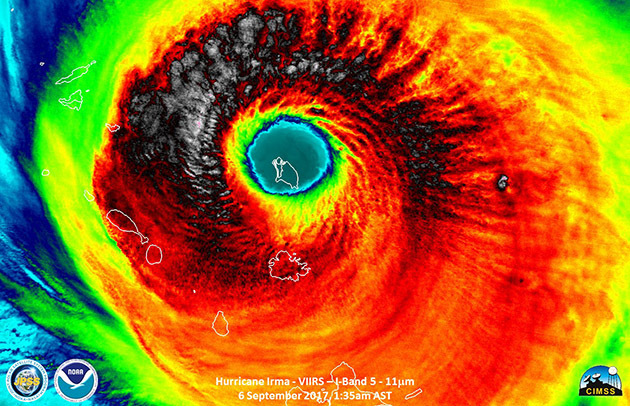 Hurricane Irma, which first struck the Leeward Islands on September 5, 2017, had sustained Category 5 winds for 37 hours, the longest ever recorded. Irma was also the strongest Atlantic hurricane ever recorded outside the Caribbean and Gulf of Mexico, and is tied with two other storms as the second strongest hurricane ever recorded in the Atlantic. 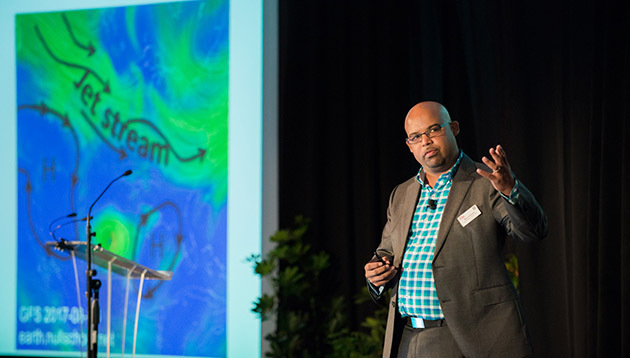 In terms of climate change, Emanuel and his colleagues found that scenarios giving rise to these rare peak winds in the Caribbean resulting from hurricanes may actually be on the increase. Overall, the 2017 hurricanes caused more than US$300 billion in damages, making it the costliest season on record. Hurricanes Irma and Maria devastated small islands in the Caribbean, such as Dominica and Barbuda, and the British Virgin Islands and Puerto Rico are still recovering, even on the eve of this next hurricane season. Dr. Eric Blake, a hurricane specialist with the National Hurricane Center, compared the predictions for last hurricane season with the recorded storms and declared the predictions to be an “epic fail.” Even given a perfect Atlantic hurricane forecast, there is still little insight into what path storms will take until they’ve formed and started moving. So, as Blake points out, seasonal predictions of total counts of Atlantic hurricanes are all but meaningless in terms of calculating landfall risk, or the chances that a hurricane will make landfall in a given area. You can have an abundance of storms form during a season that do not impact anyone; conversely, a relatively inactive season can have large impacts, like in 1987 when Bermuda was hit by Hurricane Emily, or 1992 when Hurricane Andrew was the only major hurricane to develop, devastating the Miami (Florida) region. Remembering last year’s anomalously high tides and coastal flooding in October and November—which were unrelated to hurricane activity—Bermuda should take note that those tidal ranges may be the new normal by the middle of this century. “Imagine storm surge conditions on top of sea level rise and it’s easy to conceive of a doubling of our coastal risk by the time our children are middle-aged,” Guishard said. The Risk Prediction Initiative (RPI) was established in 1994 as a collaboration between the reinsurance industry and natural hazard scientists. RPI has spent over two decades answering industry questions about climate change, natural catastrophes and hurricane risk. Recently, RPI increased its local focus on community outreach & education regarding climate and disaster risk. For more information visit the Bermuda Risk website at http://bdarisk.bios.edu.